Intrigued by what Stein might mean by ‘teaches in the seemingly agencyless phrase ‘history teaches — is ‘history not usually the taught object rather than the pedagogical subject? — I will argue in the end that history doesn’t teach that history teaches. Modernism is a topic, of course, but it is also a modality — a didactic, or more properly perhaps, an anti-didactic mode in which any recitation of what history teaches is ironized. Conventional denotative pedagogy (teacher points to text and then to an object in the world, implying or saying outright: ‘This is what it means’) is not up to the challenge of permitting the performance of such self-reflexivity, miracles playing fairly well, we might call it in Stein’s terms, as an alternative to the historical mode. 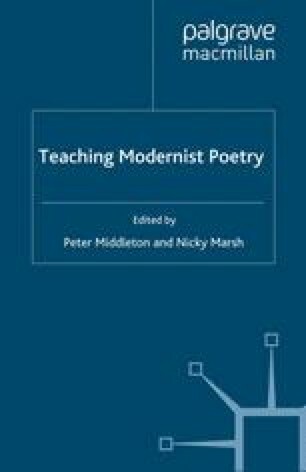 In modernism’s materials must at least implicitly be a meta-pedagogy. They cannot. A note. They cannot. A float. They cannot. They dote. They cannot. They as denote. Miracles play. Play fairly. Play fairly well. A well. As well. As or as presently. Let me recite what history teaches. History teaches. Educause Center for Applied Research (2007) ‘The ECAR Study of Undergraduate Students and Information Technology, 2007’, http://www.educause.edu/ECAR/TheECARStudyofUndergraduateStu/161967, accessed 11 January 2008. Illich, Ivan (1991) ‘Text and University: On the Idea and History of a Unique Institution’, trans. Lee Hoinacki, http://www.davidtinapple.com/illich/1991_text_and_university.PDF, accessed 11 January 2008.